You are invited to experience nature's serenity at the 4M Ranch in Paradise Valley. The 4M Ranch is located on 21 acres in Pray in south central Montana just 36 miles north of the historic north entrance to Yellowstone National Park, 29 miles south of Livingston, and 8 miles from Chico Hot Springs. We are surrounded by the Gallatin and Absaroka/Beartooth Mountain Ranges. Emigrant Peak, one of the highest in Montana at nearly 11,000 feet, is practically in the front yard where there are 2 authenticated teepee rings used by Crow and Shoshone Indians, a testament to the special nature of our location. The awe inspiring setting often encourages hiking from the front door where you might encounter some of the local deer, elk or an occasional moose. Your attention might also be captured by the aerobatics of swallows, hummingbirds, eagles, or hawks; just to name a few of the dozens of bird varieties here. Millions of acres of the Absorka-Beartooth Wilderness and the Gallatin National Forest are just 1/2 mile from your front door. Or you might be lured to Six Mile Creek, just 140 feet from the cabin, for some blue ribbon trout fishing, gold panning, or just to sit and soak in its susurrations. If you're in the mood for more water, the Yellowstone River and Daily Lake are each about 4 miles from here. Should you be out at night, maybe for a walk, or just sitting and gazing, if you're like most people your mouth will very likely drop open on its own when you see the stars. There are so many that you sometimes you can't tell where the Milky Way is because the entire sky looks like that. Many guests have said that we should tell others about that, so here it is. While we are secluded, within about 8 miles are Chico Hot Springs, 4 restaurants, a general store, 2 post offices, guide services, a tackle shop, 2 saloons, dancing, float trips, and a Laundromat. Wind surfing is 4 miles away. Spring creeks, lakes, museums, art galleries (many), gift shops, horseback and airplane rides are a maximum of 32 miles away. Yellowstone National Park is a reasonable 29 miles away. Plenty to keep you busy, if that's what you'd like. 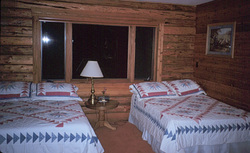 4M Ranch Log Guest Cabin: Offers a roomy, fully carpeted, Log Guest Cabin which features a fully equipped kitchen and open living room, private bath, and two large bedrooms with comfortable futons and queen, and full - enough for 9 friendly people. While relaxing in the living/dining room you can luxuriate in the 50 mile view up the Paradise Valley to the Crazy Mountains. A picnic table, barbecue grill, television, games and books are also provided for your pleasure. Directions: The 4M Ranch Bed & Breakfast is located 7 miles from Emigrant off Highway 89, 29 miles from Livingston and 29 miles from Yellowstone Park's north entrance. Yellowstone River and Dailey Lake are 3 miles away, and 8 miles to Chico Hot Springs.